Welcome to Eltham High School. It is with great pleasure that I introduce our school to you, which has been working with the community since 1926. Eltham High School is a large secondary school on the urban rural fringe of north eastern Melbourne. The school’s primary focus has always been to enhance student outcomes through the provision of high quality teaching and learning strategies. Eltham High School is highly regarded as an educational institution. Its reputation as an outstanding academic school is well recognised within the community and education circles. The co-curricular opportunities offered to our students across a range of areas including the performing and visual arts programs and the elite sports program are outstanding. Engagement with student leadership initiatives is sustained across all areas and levels of the school. 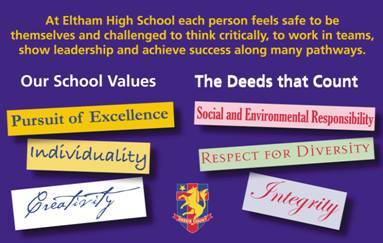 Eltham High School is a school with high expectations where you feel safe to be yourself and challenged to think critically, to work independently and in teams, to show leadership and to achieve success along many pathways. • Environmental and social responsibility. The tradition we have established continues today through the excellent work of our current staff, a team of very experienced teachers and support personnel that I am very proud to lead. Our students are consistently offered a broad range of opportunities that provide innovative and exciting educational experiences. Strong emphasis is placed on students learning from each other. Student welfare and well-being is the foundation of our school. This is enhanced by the building of positive relationships between all sectors of our community and supported by a sub-school structure with a number of coordinators at each level (junior, middle and senior); form teachers at Year 7; Transition Coordinator; Student Welfare Co-ordinator, Careers Coordinator, Special Learning Needs Coordinator, Sick Bay attendant and a series of support personnel. • A high performing school. • VCE results across all studies consistently place Eltham High School amongst the top schools in the state. • In 2008, of all the Year 12 students who applied for a tertiary course, 90% were offered a place of their choice in the first two rounds. • Students gain places in tertiary courses in medicine, science, law, business, health science, the media, humanities, the arts and sport. • Leading innovation in curriculum and school organisation. • Implementing a university research-based process of school enhancement in Victoria (IDEAS Process). • Linking students and experiential learning with their community. • Developing innovative flexible teaching and learning environments. • Creating responsible citizens to lead in the 21st century. • Developing students as leaders through a wide range of training and responsibilities. • Great Relationships: Students and staff working together to achieve their best. • Strong parent and community support enhancing student outcomes. Building further, our Elite Sports and strong Interschool Sport programs are offered to students across all age groups. Our extensive music program acclaimed as the best school bands program in Australia provides not only the opportunity for students to learn an instrument but also to represent our school and community nationally and internationally. The outstanding performance program in Drama continues to deliver acclaimed student performances at a national level. The annual Arts and Technology exhibition further supports the creative talents of both our students and our staff, as does the outstanding student writing program which culminates in the Student Anthology. Through the IDEAS (Innovative Designs for Enhancing Achievement in Schools) process, the school has developed six principles of teaching and learning which support curriculum planning and incorporate all aspects of what is known about effective teaching and learning in the 21st century, how ICT can be used to support the learning outcomes of both students and staff and how the school can inspire students by engaging them more directly in learning in the community. The introduction of a VCAL program and continuation of the Advance/Working Community program have demonstrated the potential of these real community links in improving student engagement as measured by attendance. To achieve improved student outcomes the staff is engaged in a range of professional development activities. Effective professional development needs to be delivered in a supportive atmosphere; in 2006 concrete steps were taken to identify a suitable model for establishing a sustainable Performance & Development culture in the school. The preferred collegiate model is being implemented and continuously reviewed as the vehicle for improvement. At Eltham High School we are looking forward to the future and its possibilities. We have been successful in being part of the “Building Futures” program and are currently embarking on a $9M facilities redevelopment. Demand for places at the school is at an all time high; we have put in place an agreed framework for curriculum development and delivery and confidently look forward to the future when new facilities will be put in place to match this curriculum in line with new pedagogies.